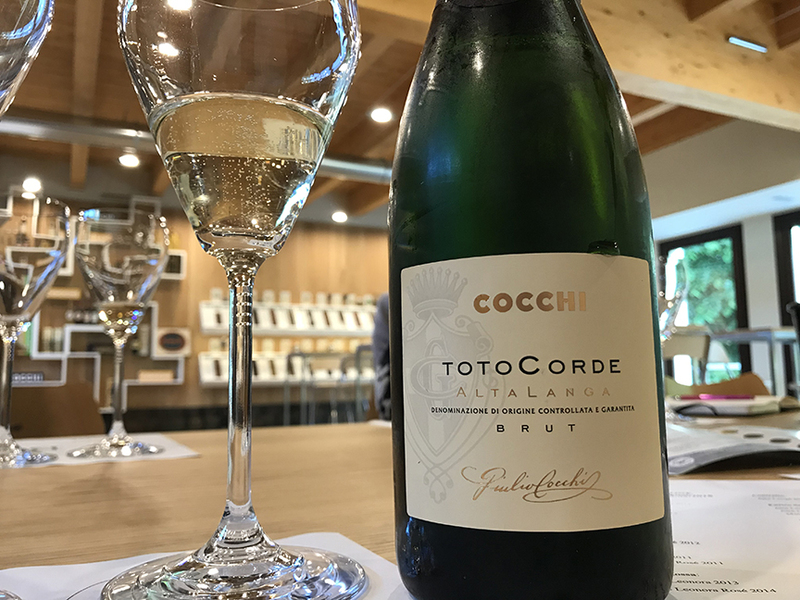 In May of this year, Alta Langa consortium president Giulio Bava graciously sat down with me at the Cocchi winery and distillery in Piedmont where we tasted 16 wines from the appellation. Many American wine and spirits insiders know his brother Roberto, marketing and export director for Cocchi, a frequent traveler to the U.S. where the Cocchi Americano vermouth has become wildly popular in recent years. Giulio and the third brother Paolo are the winery’s enologists. 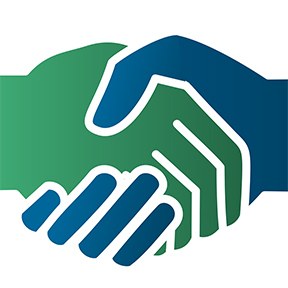 And Giulio is now in his second term as president for the Alta Langa consortium. What a fantastic flight of wines he poured for me! That’s Cocchi’s Alta Langa Brut Toto Corde 2012 in the photo above, a blend of 70 percent Pinot Noir and 30 percent Chardonnay. The Latin expression toto corde, btw, means with all my [one’s] heart. The wine, one of my favorites in the all-around great flight, really impressed me with its freshness on the nose and its glowing citrus in the mouth. It was indicative of the fresh, fruit-driven style that Alta Langa has embraced. Of the 16 wines in the flight that day, there was just one label that veered off into the oxidative style that continues to prevail in Champagne. 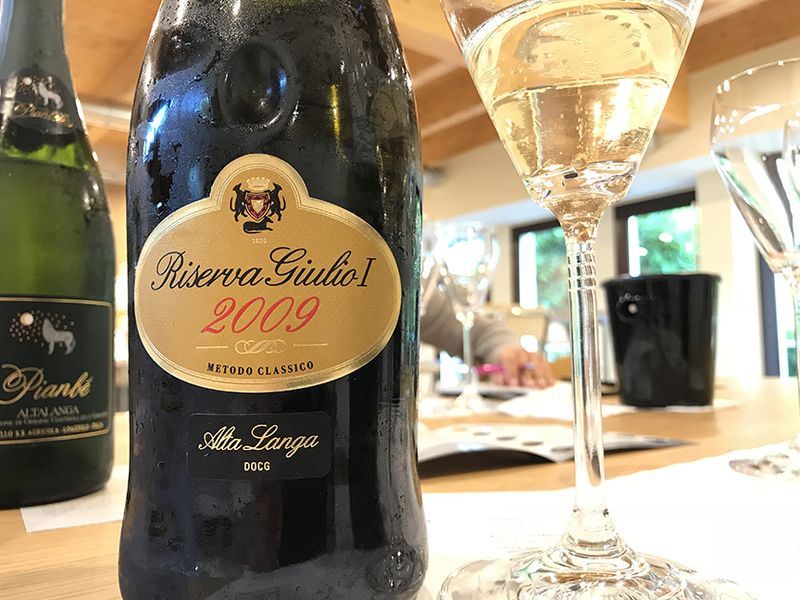 As the world’s thirst for high-quality sparkling wine continues to grow, the Alta Langa consortium and its producer members are gearing up to expand their presence in Italy and abroad. And they have a lot going for them. There are 146 townships in Alessandra, Asti, and Cuneo provinces that can produce Alta Langa. Compare that with 19 townships in Franciacorta, Alta Langa’s main domestic competitor in the high-end sparkling market. All of those villages lie to the east of the Tanaro river. In other words, they share the same soils, climate, and legacy of Barolo and Barbaresco growers. Many of the current and soon-to-be members of the consortium are already established producers of top Nebbiolo and many of them already have distribution networks in the U.S. 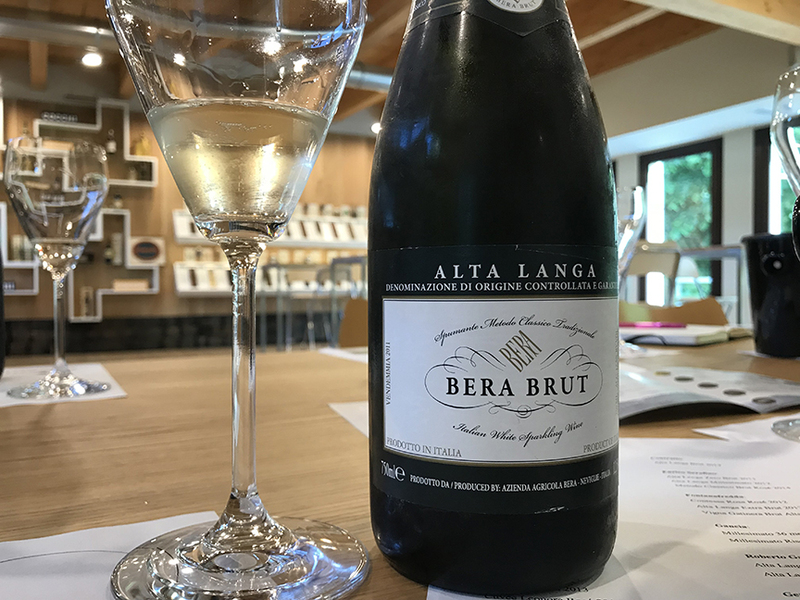 The Bera Alta Langa Brut 2011, also a Pinot Noir and Chardonnay blend, was another favorite of mine. Very fresh and clean on the nose with white floral and fruit notes that reappeared in the mouth. This wine also stood out for its gorgeous mineral character on the palate. Another great example of how Pinot Noir can perform in Alta Langa. Another thing that struck me about the flight was the Alta Langa growers’ love of Pinot Noir. Some of my all-time favorite classic method wines are made from Chardonnay (Satèn from Franciacorta and blanc de blanc Champagne, for example). In Alta Langa, producers have focused on Pinot Noir (at least gauging from the tasting Giulio put together for me that day). There were a couple of great expressions of 100 percent Chardonnay in the flight but the real standouts were the vintage-dated Pinot Noir wines. They seemed to achieve the greatest complexity and depth of fruit. But leave it to me to stay true to my heart: my top wine that day was the 2013 Roberto Garbarino Alta Langa Dosaggio Zero, which — if I’m not mistaken — is a 100 percent Chardonnay (I couldn’t find the wine on the winery’s website). 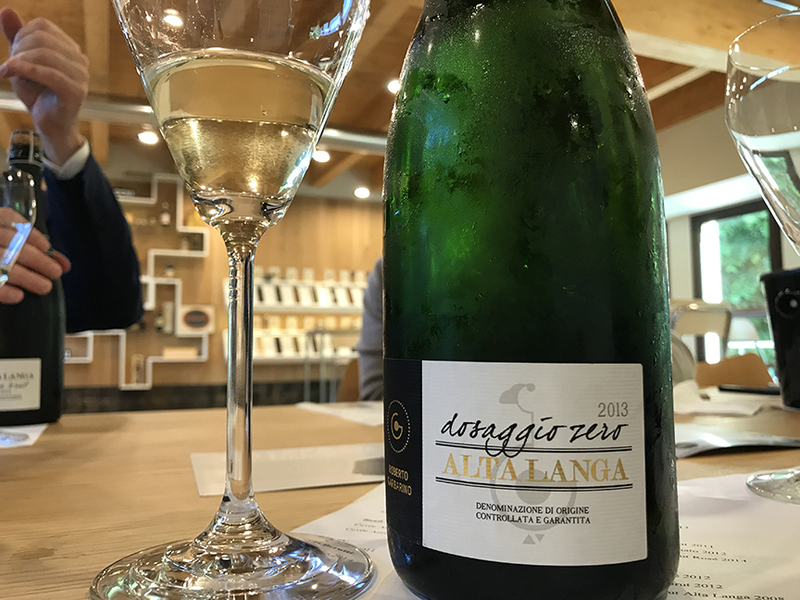 All Alta Langa must be made with hillside fruit (no valley floor allowed) and according to the estate’s site, its top Alta Langa is grown at 480 meters a.s.l. in vineyards planted 50 years ago (hey, wait a minute, wasn’t Gaja the first to plant Chardonnay in Langa?). This wine had everything that I look for in classic method: freshness, focused fruit notes on the nose and richly vibrant fruit notes in the mouth, buoyed all the while by an elegant savory quality. I loved this wine. I also liked the estate’s 2015 Extra Brut. I also have to give a shout-out to the Tosti Alta Langa Giulio I Riserva (below), 100 percent Pinot Noir. It had a touch of the pastry notes that you find in the French style of classic method wines but its glorious fruit had me coming back to the glass for another taste. All things considered, I believe we are going to be hearing (and tasting) a lot more from Alta Langa in the near future. After all, it has “Langa” in its name: how would you like to taste a classic method Pinot Noir from the land of Barolo and Barbaresco? The answer is yes, with all my heart. Thanks again to Giulio for a truly fantastic tasting. And thanks also to consortium media relations director Mariana Natale who put it together.